HARLEM — Harlem's scandal-scarred "Lion of Lenox Avenue" made a roaring comeback at the polls Tuesday, easily cruising to victory in his bid for a 22nd term in the House of Representatives. Rep. Charles Rangel claimed victory at Londel's Restaurant on Frederick Douglass Boulevard following a fierce Democratic primary contest against State Sen. Adriano Espaillat earlier this year for the District 15 seat. The Associated Press declared Rangel the winner with more than 90 percent of the vote. He was up against Republican Craig Schley, a community activist and former model and Democrat. "This is exciting," Rangel said. "You don't get numbers like that." Rangel didn't give a speech and was driven home by his good friend former New York City mayor David Dinkins. "When you get so important that the mayor of the city is driving you, then you can say something," Rangel said. 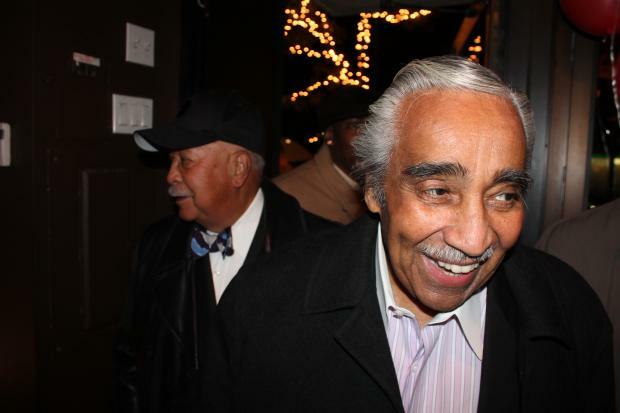 Rangel, 82, is a well-known face in Harlem and still has the support of many of his constituents, though some voters think the congressman should retire soon. Chants of "Charlie, Harlem," broke out at Londel's and people decades younger than the congressman clamored for a picture with him. Rangel was censured by Congress in 2010 and stripped of his chairmanship of the powerful House Ways and Means Committee after a series of scandals involving his rent-controlled apartments and condo in the Dominican Republic. Shila Jones, a filmmaker and teacher who was standing in line to vote at Harlem River Houses, said she was resigned to voting for Rangel. "I'm a Democrat. I'm voting for Rangel because no one is going to beat him at this point," Jones said. "This is his last hurrah. He only has one more stab at it anyway." Despite an infection earlier this year that infiltrated the cartilage in his back and caused him to be hospitalized twice and miss 103 votes in the House, some political pundits doubt this will be Rangel's last go-around. "Charles Rangel is a soldier. He often relates stories about his service in Korea. He would prefer to go out on his own terms and be beat than sit on the sidelines," said political consultant Basil Smikle. "He'll run until he can't walk or until he gets beat on the political battlefield," Smikle added. Close Rangel associate Assemblymen Keith Wright famously said Rangel could become the "Strom Thurmond of Harlem," referring to the late reformed segregationist, who served in the Senate until he was 100 years old. Asked at his victory party whether this would be his last term, Rangel said: "Only my physician knows for sure." Many voters in Harlem said they supported Rangel. Others, though, said they were not unhappy with his service or accomplishments but wanted someone new after 42 years. "He's getting up there in age, but he can still do the job," said Basil Branford, a 45-year-old Harlem resident, as he stood in line to vote. Dolores Block, 68, said she was ready for a change. "He's been in office for 40 years and it would be nice to vote for someone else," Block said. Jack Dickson, 50, who works with medical records, said he's not against Rangel but dislikes how long he has been in office. "You shouldn't be in office that long. You should have 8 years to do what you can do and then go home," he said. Other voters in Rangel's district said they were pleased to reelect him. "I have no problem with the way that Charlie Rangel serves," said Jim Capel, 63, a Harlem resident. "People say it through their votes," Rangel said as he cast his ballot at P.S. 175 on 134th Street. "A lot of reasons have caused me to run this year and I still think that I can make a difference."